The future is here, and it needs a job. 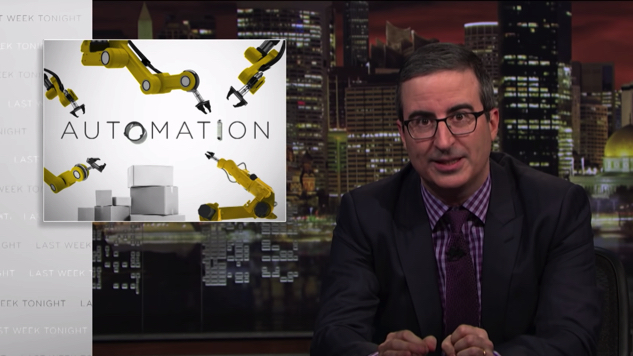 On Sunday’s Last Week Tonight with John Oliver, the HBO late-night host shares his take on automation’s bad reputation in the workforce. A recent study from Oxford University showed that nearly 50 percent of jobs will be taken over by automation. In his latest Last Week Tonight segment, Oliver theorizes that robots usually take over tasks and not jobs (i.e., ATM machines), meaning the jobs don’t “go,” they just “change.” In fact, these re-delegated job positions can also create entirely new jobs, and ones based on things that can’t even be conceived yet (i.e., snail dehydrator, investment harpist, etc.). Ultimately, Oliver can’t get around admitting that some jobs will simply be lost in the process. He concedes that it’s all a matter of preparing people to adjust to lower wages, providing the resources necessary to keep up with job requirements and crushing kids’ dreams before it’s too late. Because no matter what happens, the mermaid doctors of the future have much bigger things to worry about.